As many of my readers know my son loves Cats. One of his first few words after mama and dada was kitty cat. I wanted to review this book for him. He liked it when I read it to him. Its a simple and sweet book. We did our own Pouncing after we read it. The overall story is to use your imagination to dream of bigger and better things. Only thing I would improve is the book could have been a bit longer. Pounce is the true story of an adventurous kitten that climbs, explores, and gets into trouble. Through his strong imagination, Pounce explores deep, dark caves, climbs mountains, skates across icy glaciers, and camps out in harsh climates. Based on actual photos of Pounce and the recollections of those who loved him, the story and its visuals create a magical setting for the little cat to explore his world and express his dreams. Purchase Pounce online at Erikaengebretson.com, Amazon.com, and Barnesandnoble.com. Erika Engebretson lives with her husband and two daughters in San Jose, California. A lifelong fan of animals, Erika has had many pets throughout her life … but Pounce was the first and he has left an enduring mark that will last a lifetime. * Visit the Pounce website. 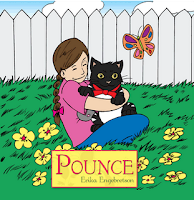 Win a copy of Pounce for your own book collection. What is the name of a special Pet you have loved? Shared this giveaway on FB as Pixie Sprinkles!